Crunch talks aimed at ending the Aberdeen bus drivers’ strike action broke down without a resolution last night. Yesterday members of Unite the Union took part in their fourth 24-hour walkout, sparked by a dispute over changes to their pay and conditions. 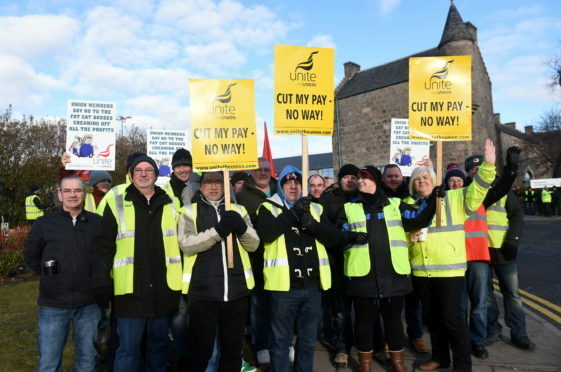 Seven days of continuous strike action will begin next week with staff also voting to escalate this to four consecutive weeks beginning on April 6 unless a resolution is found. The union claims that taking the deal will result in drivers facing longer shifts, reduced overtime rates and the removal of paid breaks. Altogether, it is estimated some drivers could lose up to £5,000 a year through the changes. First Aberdeen says the alterations to terms and conditions are necessary to protect jobs in the long term, and confirmed it has since offered improvements to the original contract changes mooted.